There are 93 Assisted Living Facilities in the Brandon area, with 15 in Brandon and 78 nearby. The average cost of assisted living in Brandon is $2,522 per month. This is lower than the national median of $3,346. Cheaper nearby regions include Valrico with an average starting cost of $2,350. To help you with your search, browse the 281 reviews below for assisted living facilities in Brandon. On average, consumers rate assisted living in Brandon 4.1 out of 5 stars. Better rated regions include Valrico with an average rating of 4.7 out of 5 stars. Caring.com has helped 5 families in Brandon find high-quality senior care. To speak with one of our Family Advisors about assisted living options and costs in Brandon, call (855) 863-8283. New Life Home Care Inc.
Brandon, Florida, is part of the Tampa Bay metropolitan complex, the third most populated city in Florida that is renowned for its pristine beaches and amusement parks such as Busch Gardens. Seniors have a variety of ways to spend their leisure time, and this area has a large number of Assisted Living Facilities (ALFs) to choose from for seniors that need them. There are 15 ALFs in Brandon and an additional 42 nearby. In Florida, these facilities provide home and health care services to the elderly in a homelike setting. The facilities provide assistance with daily activities such as personal care and medication management. The Florida Health Care Association regulates the policies of these ALFs. The Brandon area is home to world-class medical facilities, including Brandon Regional Hospital, in the event of medical emergencies or illness. Brandon received a Sperling's Comfort Index rating of 79 out of 100, compared to the national average of 54. Seniors can enjoy the outdoors year-round as there is no snow and a January average low of 48 degrees. The humidity and hot 91-degree average July high might be uncomfortable for some. Seniors and their loved ones may be concerned about the crime rate in Brandon. Both violent crime and property crime are higher than the national average with scores of 53.3 and 55.2 out of 100 (1 being the safest) compared to the U. S. averages of 31.1 and 38.1, respectively. Seniors with a respiratory illness living in this area should affect how its air quality may affect them. The American Lung Association gave Hillsborough County a poor Ozone grade of F, while the Particle Pollution 24-hour score was an excellent A. The city of Brandon is in close proximity to Tampa, where seniors can visit the Straz Center for theater and opera performances. Seniors can also visit the International Independent Showmen’s Museum in the neighboring town of Riverview, to experience American Carnival memorabilia, photos and artifacts. Seniors in the Brandon area can easily maintain their independence thanks to HART, the Hillsborough Area Regional Transit system. HART has multiple routes that cover the county, a trolley, and a free in-town shuttle. Seniors qualify for reduced fare. Assisted Living costs in Brandon start around $2,522 per month on average, while the nationwide average cost of assisted living is $4,000 per month, according to the latest figures from Genworth’s Cost of Care Survey. It’s important to note that assisted living rates in Brandon and the surrounding suburbs can vary widely based on factors such as location, the level of care needed, apartment size and the types of amenities offered at each community. 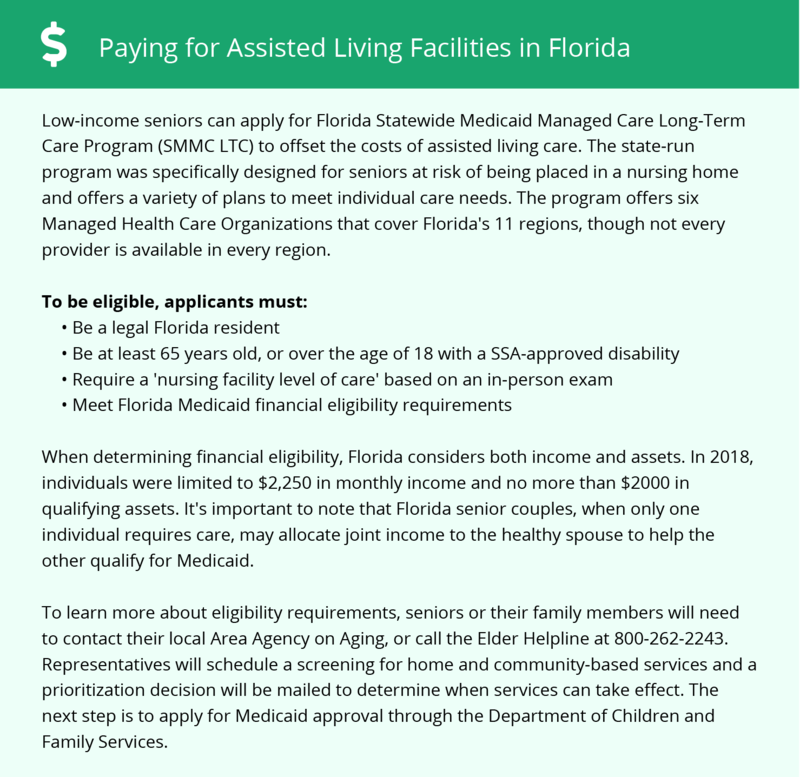 Low-income seniors in Florida may be entitled to receive help paying for assisted living through the state’s Medicaid Managed Care Long-Term Care Program. In addition, the state provides financial assistance through the non-Medicaid Optional State Supplement (OSS). Brandon and the surrounding area are home to numerous government agencies and non-profit organizations offering help for seniors searching for or currently residing in an assisted living community. These organizations can also provide assistance in a number of other eldercare services such as geriatric care management, elder law advice, estate planning, finding home care and health and wellness programs. To see a list of free assisted living resources in Brandon, please visit our Assisted Living in Florida page. Brandon-area assisted living communities must adhere to the comprehensive set of state laws and regulations that all assisted living communities in Florida are required to follow. Visit our Assisted Living in Florida page for more information about these laws.